What are Chemical Weapons and Their Effects? What are Biological Weapons and Their Effects? How Will I Know If a Chemical or Biological Attack Has Occurred? Why Do I Need Chemical Detection Equipment? Okay, I Know a Chemical or Biological Attack has Occurred or is Underway: What Now? What Are Some Specific Scenarios for a Chemical or Biological Attack? I've Been Contaminated With a Biological or Chemical Agent. What Do I Do Now? I've Been Exposed to a Chemical or Biological Weapon, and May Not Have Decontaminated in Time: Now What? What About Non-Traditional Medical Remedies? What Chemical & Biological Detection Equipment Is Available to the Public and First-Responders Here? What are some practical strategies for employing these M8, M9, M256A1 Chem Detectors & the Anthrax test kit? To See Why Potassium Iodide Pills will be all the rage then! Recently, these weapons came to the center of American consciousness. Chemical and biological warfare, or CBW, is considered a "poor man's nuke," for the cheapness and ease of manufacture, and the indiscriminate carnage and terror they can cause. The 'good news' is; that awareness, early detection, and protective measures against exposure, can be successfully accomplished, even in an ongoing developing emergency, when armed with the proper knowledge and preparations. Practical survival for families is possible. Read The New York Times #1 Bestseller book "Germs" for a primer on what we are all up against here. See below here the different Chemical & Biological Detection that is available to the Public and First-Responders here. Q: What are Chemical Weapons and Their Effects? A: Chemical weapons are organic and inorganic chemical substances that are harmful to humans. There are several different types of chemical agents. All work in a different manner, but are the same in one facet, in high enough concentration, they will all kill humans. Nerve Agents: These are agents such VX, Sarin, Soman, and Tabun. These agents are organophosphates, a type of chemical usually used as insecticide. These agents cause the victim to go through failure of the Central Nervous System. The agent interferes with enzymes in the brain, like all organophosphates. The agent causes convulsions, drooling, involuntary defecation and/or urination, running nose, etc. The convulsions can be so severe that they break bones. Eventually, the agent causes the heart to stop, and the victim dies. Vesicants (Blister Agents): These are agents such as Sulfur-Mustards, Phosgene Oxime, Nitrogen-Mustards, Lewisite, Mustard-Lewisite, etc. Vesicants are all common in the fact that they burn and blister the lungs, skin, and eyes. When these agents come into contact with tissue, they create terrible burns and blisters, which are extremely painful. A victim can killed by a vesicant when blisters are created in the lungs. When the blisters burst, they fill the lungs with fluid, and the victim drowns to death in the fluid. Blood agents: These are agents like Cyanogen Chloride and Hydrogen Cyanide. They act to poison the blood, and act quickly, like nerve agents, within about five minutes. Coma and convulsions usually precede death of the victim. Choking Agents: These are agents such as Ammonia, Chlorine, and Phosgene. These agents cause damage to the lungs, where the lungs fill with fluid and the victim drowns to death, much like vesicants. All of these agents are extremely dangerous, and all are a very painful way to die. It should be mentioned, that many other deadly chemicals reside in our nation's chemical industries, and sabotage of these plants is a distinct possibility. Chemical weapons are NOT gasses, as they are frequently called. They are either in liquid form (A good comparison would be small droplets of Karo syrup or molasses.) or aerosol (A good comparison would be a cleaner or disinfectant in a spray can.) form. All of these weapons can effectively be defended against with protective equipment. Pungent odor, greenish-yellow heavier than air gas. Corrosive to eyes, skin and respiratory tract. Burning sensation followed by coughing, headache, labored breathing and nausea. Pulmonary edema. Immediate irritation in high concentrations. Symptoms of lung edema may take several hours to appear. Almond odor, highly volatile gas. If high concentration � violent convolutions after 20-30 seconds, breathing stops in one minute; cardiac failure occurs within a few minutes. Very rapid; incapacitation within minutes and death within 15 minutes. Colorless, oily liquid with little odor in its pure states. Amber to geranium-like odor with amber to dark-brown color in less pure form. Stinging pain followed by blistering. It is also a systemic poison causing pulmonary edema, diarrhea, hypotension and restlessness. Possible garlic odor, medium volatility, oily liquid. Blisters or irritation to skin, eyes and lungs. Fresh cut hay odor, heavy gas. Coughing and choking followed by chest tightness, nausea, tearing, vomiting and headaches. Death due to fluid accumulation in the lungs. Difficulty breathing, miosis, blurred vision, headache and nausea leading to respiratory distress, convolutions and eventually death. Difficulty breathing, miosis, blurred vision, headache and nausea leading to respiratory distress, convulsions and eventually death. Colorless/odorless, low volatility, oily liquid. Relatively rapid (within 30 minutes). *Whether the heartrate is fast or slow will depend on the particular agent and on on how long it has been since the exposure. **Blisters may also form as a result of thermal injuries or of exposure to agents such as T2 toxin. Thermal injuries may be differentiated by history or evidence on the scene; toxin effects are generally accompanied by by symptoms such as fever or chills. Bottom Line: Chemical weapons can be considered akin to an insecticide for humans. In fact, German scientists researching new insecticides before World War II discovered the first nerve agents. Q: What are Biological Weapons and Their Effects? A: Biological weapons are diseases harnessed by man as a military weapon. Many diseases have been mentioned as being possible BW agents. However, the most mentioned are Anthrax, Venezuelan Equine Encephalitis, Botulinum toxin, Plague, Ricin, and Smallpox. Biological weapons can be bacteria, viruses, or toxins, and essentially are nothing more than intentionally spread disease. The BW agents mentioned above are selected for their characteristics, including ease of manufacture, incubation period, resistance to treatment, method of dispersal, hardiness in different environments, lethality, and contagiousness. There is evidence Soviet scientists genetically altered diseases at their BW laboratories, making diseases even more lethal and resistant to treatment. It cannot be assumed that a BW agent can be treated. As stated in the last paragraph, some of these diseases have been altered to resist treatment, and some diseases, mostly viruses, have no cure. As with chemical weapons, the best defence against these agents is protective equipment and good hygiene. The following is from the US Army (USACHPPM) Tech Guide 244, The Medical NBC Battlebook. * Incubation applies to infectious diseases. With toxins, it's application refers tothe period between exposure and appearance of the symptoms and signs of poisoning. An anthrax weapon aimed at a major city could kill at least 123,000 people even if every victim received treatment, experts have calculated. US researchers have used a computer model to predict the devastation that would result from the launch of an anthrax bomb or missile on a city the size of New York. The figures are based on what would happen if a bomb containing 1 kilogram of anthrax spores was dropped on a city of 10 million inhabitants. The projected number of fatalities is based on the assumption that antibiotics would not be administered for 48 hours until the first symptoms appeared. If it proved possible to distribute drugs more quickly, then the death toll could be substantially reduced. However, they warn that inadequacies in the current US emergency response plan may make such a rapid response unlikely. Lead researcher Dr Lawrence Wein, from the Graduate School of Business at Stanford University, California, said: "The first people develop symptoms within two days of exposure, and many more would develop symptoms over the next week. "Our response needs to be measured in hours, not in days or weeks." The researchers recommend distributing anti-anthrax antibiotics such as Cipro in advance of any major attack. If this was not possible, then the aim should be to distribute antibiotics to everyone infected within 12 hours. In the case of an attack on New York City, that would mean supplying the drugs to 1.5 million people. The only way to do this would be to increase the number of available health professionals dramatically. The researchers estimate that to keep the death toll down to about 1,000, one health professional would be required for every 700 people in the affected population. Dr Robert Spencer, an infection control expert at the UK Public Health Laboratory Service, told BBC News Online that the conclusions were similar to those reached by research carried out by the World Health Organization in 1970. However, he said it was very difficult to determine what would happen should weapons grade anthrax be released on a city, not least because of weather patterns, and the complex effect of wind distribution in a built up area. Dr Spencer said the only recorded case of anthrax release, from a Soviet installation in 1974, had resulted in surprisingly few cases of illness. "It would be very difficult to disprove what they are saying," he said. "My personal feeling is that anthrax is not a weapon of mass destruction, but a weapon of mass hysteria. "Terrorists like bombs, they know what happens when they cause an explosion, and can make predictions based on that." Bottom Line: Biological weapons are simply diseases. Some have been altered to be more virulent, but all are just the same diseases the world has confronted for years. 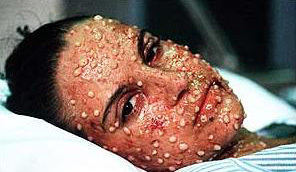 Remember, smallpox used to be occurring in epidemic proportions before the smallpox vaccine. And, plague wiped out over a third of Europe's population during the Black Death. These diseases, for the most part, are nothing new. Besides these symptoms, you can use chemical detection equipment to detect a chemical attack, but usually not a biological one easily. To detect a biological attack, you must look for the signs of dispersal, such as unusual clouds, spraying, etc. Bottom Line: Chemical and biological attacks can be detected early, by watching for signs of dispersal, dead insects/animals, sick and injured people, etc. The government's Emergency Alert System (EAS) may also be of value in alerting you to an attack. Chemical attacks can also be detected with inexpensive chemical detection gear. Q: Why Do I Need Chemical and/or Biological Detection Equipment? That's why chemical detection equipment is key. Unlike us, they can remain on alert 24/7. Once your chemical detection equipment detects an agent, you can take immediate protective measures against the agent. 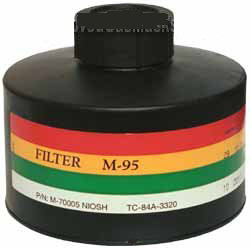 M-9 tape and M-8 paper, the more common pieces of chemical detection equipment, and sold below, only detect several nerve agents and one type of vesicant. They do not detect other types of chemical weapons such as choking or blood agents, or other types of vesicants like Phosgene Oxime. Furthermore, M-8 and M-9 paper only detects liquid agents, not aerosols or extremely small liquid droplets. M-256A1 kits are another matter. The M-256A1 has special test tickets that will detect aerosolized nerve, blood, and blister agents, as well as a booklet of M-8 paper for liquid agent detection. Now, these different types of equipment may be somewhat confusing. To put it simply, M-8 and M-9 paper is used mostly as a "24/7" detector, always ready to detect agents. M-8 and M-9 paper are not the most accurate pieces of equipment, and since they do not detect aerosolized agents (As described in a previous topic. ), the M-256A1 kit was designed. The M-256A1 kit is used when a chemical attack is suspected, and M-8 and M-9 paper is not detecting anything, to confirm the results of M-8 and M-9 paper, and to determine when it is safe to unmask or leave the safe room. The M-256A1 kit is the best chemical detector besides the large, expensive air sampling equipment used in the military's FOX NBC defense vehicle. There is more info on the use of chemical detection equipment in the next section. Important Note: Chemical detection equipment ONLY detects some of the more common chemical weapons, it does NOT detect biological weapons. Anthrax detection kits are available here, but these are not for the untrained public. Both chemical detection equipment and Anthrax test kits are available below here. Along with the section following it entitled; What are some practical strategies for employing these M8, M9, M256A1 Chem Detectors & the Anthrax test kit? Q: Okay, I Know a Chemical or Biological Attack has Occurred or is Underway: What Now? A: You must immediately take protective measures to keep yourself from being contaminated with the agent. There are two schools of thought when it comes to protection against CBW agents: Safe rooms, or protective masks and suits. When it comes down to it, protective gear is not something to trust your local army surplus store to. Surplus stores usually have obsolete, expired, and in some cases, defective equipment. If you are caught in a crisis situation where good modern protective masks and suits are not available, some expedient gear can be constructed or bought. Garage-type Tyvek coveralls or rubber rain suits, both found at hardware stores, will provide some protection against chemical and biological weapons injuring you through your skin. They will also stop alpha and beta radiation, but definitely not gamma radiation. Make sure the suit you buy has a hood, so you are able to make a seal around your head and neck. Many hardware stores sell many types of gloves. One type, are the butyl rubber chemical gloves. These gloves are essentially the same as real NBC gloves. Check the label/sticker/carton and make sure they are resistant to corrosive chemicals, such as sulfuric acid, etc., to gain some indication of the glove's suitability for use. Tuck the gloves inside the sleeve so that the agent doesn't drip inside the glove. N-95 dust masks, and the half-mask respirators used by painters, etc., provide excellent protection against inhaling radiological particulates. The N-95 dust mask will provide some protection against some of the larger biological agents, and the half-mask respirator, as long as "P100" is marked somewhere on the canister or the packaging, will stop almost all biological agents. The N-95 dust mask will provide almost no protection against chemical agents, but the half-mask will provide some measure of protection if it is also rated for some types of household, industrial, or commercial chemicals, like solvents and paints. Several layers of wet cloth, such as a T-shirt, placed over the nose and mouth, may be better than nothing against radiological particulates and some biological weapons. Purchase some gas-tight, or otherwise enclosed goggles if your mask does not protect your eyes as well. Rubber boots must be purchased to keep the agent from entering the bottom of the suit. Tuck the boots inside the pant leg so that agent does not enter the boot. Use the silver colored duct tape to seal the gaps, such as where the gloves and boots are tucked into the suit, and around where the mask and hood come together to keep agent from entering. However, it should be noted that such expedient equipment provides very little protection against CBW agents. The US Army Soldier Biological-Chemical Command tested types of suits police departments were buying for use in an emergency. They found Garage-type Tyvek coveralls, even when in combination with military-grade protective masks, gloves, and overboots, were found to provide only twice the protection as someone wearing just regular clothing and a good protective mask. Still, expedient equipment is much better than nothing, and should be seriously considered in a crisis. The more appropriate measure for civilians is the safe room. We do not have civil defense, and so we do not have the massive resources the military has to provide an agent free area for soldiers to get out of their gear so they can eat, sleep, etc., as you cannot eat wearing protective gear, only drink, and that's if you have a drinking system in your mask. So, a safe room is the best option. It should be noted, that having protective masks and suits as a backup is a VERY good idea, in case it is necessary to leave the safe room, because of fire or other dangers. A safe room should be done using a positive pressure NBC filtration system. Radius Defense's NBC Life Cell and American Safe Room both have excellent units. These systems create a positive atmospheric pressure in your safe room, keeping agents from entering. At the same time, air is brought into the room through an NBC filter. The Israeli Homefront Command (Civil Defense) and the Federal Emergency Management Agency recommend a safe room made from duct tape and plastic sheeting. However, the Israeli's use this method of safe room in conjunction with a protective mask, as the safe room is not trusted to protect against aerosol agents, only liquid droplets. FEMA has neglected this in its recommendations. Even still, this is a minimalist method, and definitely not the best one out there, even when combined with a good protective mask. If you are, however, caught in a crisis situation when a good positive pressure safe room kit is unavailable, this may be your best option. Purchase the thickest plastic sheeting you can buy (6 mil is the thickest usually sold at most hardware stores. ), and the silver looking duct tape, which is the stickiest available. Use pins to hold the plastic sheeting to the wall, then use the duct tape to seal it. Still, you will not be able to achieve an airtight seal, no matter how hard you try, make it the best you can, then don your mask. It should be noted, that many of the current production NBC protective masks, such as the M-95, have a drinking attachment. The attachment allows you to drink from a special canteen without removing your mask. Check for, and decontaminate if necessary, biological or chemical agents on the canteen's connection to the mask before use in a contaminated environment. Make sure you keep the canteen top well sealed on the canteen so agents do not leak inside. Q: What Are Some Specific Scenarios for a Chemical or Biological Attack? A: There are many, many scenarios possible. An attack could occur at any time, and really, in any place. You will need to be ready at all times to take protective action and decontaminate. For example, you're away from your house, (And the safe room and other NBC equipment.) and suddenly, you notice your chemical detector shows a response! What do you do? What if your children are at school, and your spouse is at home or work? What if you live in a major city and mass transit is your only way around town? It may be a good decision to carry an escape hood. An escape hood is a small pocket sized gas mask. These hoods do not have a drinking system, and are usually intended for short use, long enough to get to a real protective mask and suit. While you won't have much protection against absorbing the agent through your skin, the protective mask has always been the mainstay of NBC protection, and you will have a much greater chance of surviving if you have it. After donning your escape hood, you must get away from the crowds. This is where terrorists or others will use any further weapons. Remember, they want to kill as many as they can, they won't chase down every person going the other way, only the crowd. Try not to make yourself, and your mask, obvious. Try to stay away from others, who may try to take your equipment. Carefully and calmly evacuate away from the affected area. Consider staying inside a building until the crowds of people have passed, again, you do not want to be caught up in the mass of people. Once you feel it is safe, return to your home, and decontaminate yourself. (Keep in mind, that if you are in an urban area, and you use mass transit instead of a vehicle, walking may be your only option. Police may set up roadblocks and you may be kept from using your car and be on foot.) Quickly don your protective mask and suit, or enter your safe room. Consider treating yourself (Described below) if you are experiencing symptoms of exposure to a chemical agent or feel you were exposed to a biological agent. Now, what if other members of your family are elsewhere? You must have already created a plan that every family member knows. Your children and spouse must all know where to go, and what to do if an emergency happens. Talk to your children's school and ask what they plan on doing in an emergency. There is a good chance you will not be able to pick them up during an attack. If you or your spouse is has a position essential to the community (Police officer, fireman, EMS, public works, etc. ), or is in the military, you or they may be required to stay on the job. Your plan is decided by your unique situation. Q: I've Been Contaminated With a Biological or Chemical Agent. What Do I Do Now? A: You must decontaminate, or remove the contaminate from your body, immediately. If you have bulk agent on your skin (Droplets of a liquid that look like molasses or Karo syrup. ), DO NOT SCRAPE IT OFF with a Popsicle stick or object. It will only serve to spread the contamination to your hands and increase the uptake of the agent to your body by spreading it more evenly on your skin. You can however, scrape bulk agent off when wearing a protective suit, just not on exposed skin. Decontamination with soap and water may be your best option when nothing better is available. The military uses special decontamination kits that it issues to its troops, called the M-291 and M-295. These are small wipes or mitts (In the M-295's case.) that are used for fast, immediate decon. 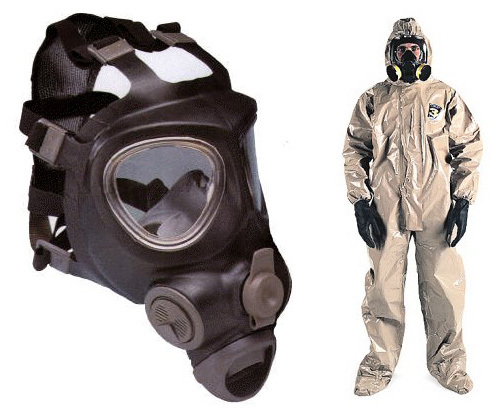 The M-291 is for decontaminating exposed skin, and the M-295 for personal equipment. Both use a special resin that adsorbs and neutralizes chemical weapons. Remember, time is of the essence in decontaminating yourself, as the damage done to your body by nerve agents for example, is irreversible. Many biological weapons, as previously stated, have no treatment or cure. However, for general-purpose decontamination, bleach is your best option. A concentration of 0.5% hypochlorite solution for skin, and 5% for equipment is considered universal for all biological and chemical agents. For decontaminating large areas or pieces of equipment, DS2 is your best solution. DS2, or Decontamination Solution 2, is the military's weapon of choice in dealing with NBC decontamination on a larger scale. DS2 is essentially the trisodium phosphate you can buy in the paint section of your local hardware store as a paint stripper. Mix a strong solution of it, and use a sprayer to spray it on the contaminated object. Remember, trisodium phosphate is a paint stripper, which is why the military has a special paint on all of their equipment. However, having to repaint, say, your car, in the long term may be preferable to having it contaminated with a deadly CBW agent. Do not use DS2 on personnel, even if they are wearing a protective suit and mask. Also remember, DS2 is flammable. Be sure to wear a protective mask and suit when decontaminating, as you may be contaminated yourself with the agent when removing it from another surface or person. Bottom Line: You must remove the agent from your skin immediately, or else major damage can result. Military M-291 and M-295 kits are great for quick decon, but do-it-yourself bleach and DS2 decon solutions also have an important place. Q: I've Been Exposed to a Chemical or Biological Weapon, and May Not Have Decontaminated in Time: Now What? A: So, you've decontaminated, yet still may have been infected by a biological agent, or the effects of the chemical agent are occurring. Luckily, for chemical and biological weapons, there are some treatments. When it comes to nerve agents, there is an antidote that the military issues to its troops. It is called the Nerve Agent Antidote Kit Mark I. (NAAK). It consists of two auto-injectors, one containing atropine sulfate to keep your heart beating, the other 2-PamCl to help remove the agent from your body. Note: A NAAK cannot reverse the damage already done by nerve agent; they just keep it from damaging you further. Unfortunately, NAAK kits are not available to civilians at this time. Blood agents, choking agents, and vesicants do not have treatments that most civilians can procure. There are some treatments that can be done at major medical centers (Which will probably be fully packed with patients soon after the attack. ), however. Still, no treatment can reverse the effects the agent had upon you. For biological agents, antibiotics are your only option outside of a hospital. Even still, some biological weapons are viruses, which antibiotics have no effect upon. Others have been modified so that they are resistant to antibiotics. Even still, they are your best bet. Doxycycline (Sold under a variety of brand names.) is considered by the US Army Medical Research Institute for Infectious Disease to be the drug of choice, as it works well against almost all biological weapons that can be treated with antibiotics. Consult your doctor before procuring antibiotics. If you suspect someone in your family has been infected with a biological weapon, you must immediately isolate them. An "isolation room," created by using your positive pressure NBC filtration safe room unit, hooking it up to your safe room, then switching it to negative pressure will provide air to the patient. The negative pressure will keep the possible biological agent inside the safe room, so that it doesn't contaminate you or the rest of your house. Bottom Line: There are some treatments for chemical and biological agent exposure, however few are available to most civilians, and none are foolproof, especially when it comes to biological agents. Be sure to isolate a possibly infected person in an "isolation room." So, planning on being exposed and then treating yourself, as some believe, is by far not an intelligent decision. Taking protective action is your best choice when it comes to biological and chemical agents. Q: What About Non-Traditional Medical Remedies? A: Much has been said about the effectiveness of colloidal silver and certain herbal remedies against biological weapons. According to FEMA, the Centers for Disease Control (CDC), and USAMRIID, no herbal substance or compound can cure, treat, or prevent an infection by a biological weapon. Antibiotics are the only cure for bacteriological agents, antitoxins, like botulinum antitoxin for botulinum toxin, are the only cure for a biological toxin, and there is promising research on interleukin-2 and interferon being a cure for viruses. Unfortunately, there is no evidence to even begin to suggest some herbs may be treatments or cures for biological weapons. Colloidal silver is another matter. This substance actually does work. Colloidal silver will disinfect surfaces of pathogens according to laboratory results. Some people have decided to drink a solution of colloidal silver as a preventative and treatment for disease. Unfortunately, several people, including a Libertarian Senate candidate, have developed a disease called argyria in the past few years. Argyria is caused when the silver particles settle in the skin. The skin then turns a gray-blue color, and is permanent. Taking colloidal silver as a remedy can be considered akin to drinking bleach or hydrogen peroxide in order to achieve health benefits. Considering that there is no laboratory evidence to suggest that colloidal silver has any health benefits, taking it can truly be considered too much of a risk. Still, the jury is still out on whether colloidal silver can be considered anything more than a disinfectant that costs more than regular disinfectants that disinfect just as well. Q: What Types of Chemical & Biological Detection Equipment are Available to the Public and First-Responders? A: Description of M9 Chemical Detection Paper below, followed by M8 and M256A1 kit, then some more practical suggestions for utilizing them all. Also, just added the SMART-II Anthrax (Spore) Test Kit below! M9 Chemical Detection is used by ground forces and is placed on personnel and equipment to identify the presence of liquid chemical agent aerosols. It contains a suspension of an agent sensitive red indicator dye in a paper matrix. It will detect and turn pink, red, reddish brown or red-purple when exposed to liquid nerve agents and blister agents, but it does not identify the specific agent, nor does it detect any biological agents, such as anthrax. This is current manufacture with an expiration date of December, 2006. SPECIAL INTRODUCTORY OFFER ~ Just Released ~ VERY LIMITED QUANTITY! Only $15.00 each for the single card strip above, for as long as they last! Chemical Agent Detector Paper, M9 is the most widely used method of detecting liquid chemical agents. M9 Paper reacts to chemical agents by turning a red or reddish brown color. Place the M9 detector paper to opposite sides of the body. If you are right handed, place a strip of M9 paper around your right upper arm, left wrist, and right ankle. If you are left handed, place the M9 paper around your left upper arm, right wrist, and left ankle. It is also attached to large pieces of equipment (eg: conditioning systems, shelter or van entrances or vehicles). When attached to equipment, it must be placed in an area free from dirt, grease, and oil. This is especially important since petroleum products and DS2 also cause the paper to change color. M9 Paper is especially useful in detecting on-target attacks and keeping soldiers from entering contaminated areas. Whenever pink, red, reddish brown, or purple color appears on the paper, suspect the presence of chemical agents. As soon as M9 Paper indicates the presence of chemical agents, soldiers and units must take protective action to keep from becoming grossly contaminated. The results of the M9 paper should be confirmed with the M256 kit. Night operations present some problems when using M9 Paper. Color changes will not show up when a flashlight with a red filter is used to read the paper. White light must be used. This could cause some serious OPSEC problems, especially for frontline troops. Commanders must realize that there is a risk if they do not establish procedures for checking M9 Paper for color changes. Soldiers can be rotated into a white light area or the M9 Paper can be collected periodically for reading. This is the next step up. 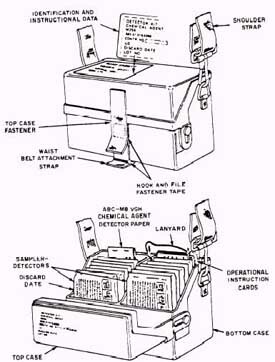 The M-8 Chemical Detector AND AGENT IDENTIFER. This product was originally designed for military reconnaissance to detect the presence and identity of chemical agents producing agent specific color changes. When activated by chemical agents, this detector may appear to become polka dotted. Compare the color of the dots with the colors marked on front to determine the identity of the specific agent. Organic solvents such as brake cleaner and bug sprays can cause false readings with product. Do not ingest this product. Please note, this product cannot identify biological agents such as Anthrax. This product must remain dry, as it will not work properly if wet. Product shelf life is unlimited, IF kept dry. Only $25.00 each for the single card strip above, for as long as they last! We'll tell you here when they are all gone on the order page. The M256A1 Chemical Agent Detector Kit above is a compact, simple-to-use kit designed to detect blister, nerve and blood (cyanide) agents. It also determines the type of agent present or confirms the absence of a hazardous concentration of agent. It is used after a suspected chemical attack to confirm the event and then later to determine if it is safe to unmask or reduce the protective posture level. This is one of the military's most sensitive devices for detecting Chemical Agents and detects all agents at levels below those that can kill or injure people. It was used extensively during the 1st Gulf War and is widely deployed with our troops in Iraq today. 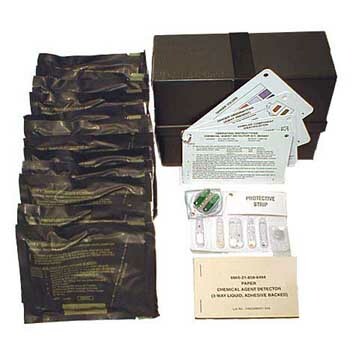 The kit consists of: -A plastic carry case with velcro closure -A booklet of M-8 test paper sealed in a plastic bag -Attached instruction cards -12 sampler-detector pouches, each consisting of eight glass ampoules (each filled with chemical reagent), three test spots, a chemical heater, protective strips, and tabs. You would use the sampler detectors to test for chemical agents in the vapor form. The M-8 paper is used to check for chemical agents in the liquid form. The test consists of: -Activating the sampler by breaking the integral crushable ampoules and releasing test reagents -Exposing the activated test disc to ambient air -Comparing the observed color change to the color chart in the instructions, thereby determining the presence or absence of chemical agents. As its name implies, the M256A1 vapor-sampler is used to test vapors for the presence of nerve agents, blood agents, and blister agents. It is the primary testing device in the M256A1 kit. When issued, each new M256A1 kit contains 12 of these miniature chemistry sets, each sealed in a plastic laminated foil envelope. To minimize the chance of error, two persons should conduct a vapor-sampler test; one person reads the instructions and the second person performs the action. When necessary, one person can successfully operate the vapor-sampler. Vapor-samplers are used once and discarded. The vapor-sampler's plastic body holds the test components and connects the components of each individualized test to each other. Each sampler body has several glass ampoules, one hinged heater assembly, three test spots, one hinged protective strip, and a lewisite-detecting tablet with rubbing tab. The glass ampoules contain various chemical solutions, called "reagents", that react in predictable ways to the vapor forms of nerve, blood, and blister agents. The glass ampoules are used in the individual chemical agent tests in which two heater ampoules are used with the heater assembly in the blister agent tests. The ampoules are visible from the back of the vapor-sampler and are connected to their appropriate test spot by a channel molded into the plastic vapor-sampler body. Ampoules are crushed between gloved fingers to release the reagents contained within. There are three test spots, one for each of three CWA tests. Each test spot is positioned on the sampler body to minimize the chance of cross-contamination between test spots and ensure both sides of each spot are exposed to the suspect vapor. To assist the operator in identifying the test being conducted, each test spot is shaped differently. The name of each test (nerve, blood, and blister) is also printed above each test spot. Each test spot is made from a different material selected for its strength, sensitivity, functionality, and reliability. The nerve agent test spot is star shaped and made from filter paper. The blood agent test spot is round and made from a glass fiber filter. Lastly, the blister agent test spot is square and is made of chromatographic media. The remaining components�the hinged heater assembly, hinged protective strip, and a lewisite rubbing tablet�are connected to the sampler body by rivets and a tab. The vapor-sampler's heater is used with the blister agent test spot. The heater improves the evaporation of the blister agent test reagents, which helps the test achieve its required sensitivity. It generates heat through a chemical reaction from chemicals in the heater's ampoules. It is riveted to the sampler body so that the operator can swing the heater over the blister agent test spot to conduct the test and swing it back out of the way to observe the test results. The protective strip is also riveted to the sampler body. It is positioned over the blood and nerve agent test spots to help protect them from accidental contamination. Finally, the lewisite detection tablet is covered by a protective plastic pull-tab that must be opened before use. Each M256A1 kit comes with one booklet (25 sheets) of M8 paper. Unused M8 paper is tan in color and has three sensitive indicator dyes suspended within the paper. M8 paper responds (changes color) within 30 seconds of exposure to liquid G and V nerve agents and H or L blister agents. Each of these CWAs has a different level of acidity (pH). The detector dyes react to the different pH levels by changing to one of three colors. The color yellow indicates the presence of a G nerve agent; the color green indicates a V nerve agent. Exposure to either H or L blister agents produces a red color (see Figure 7). M8 paper does not have to be completely saturated with a liquid chemical agent to produce a test result. It reacts to a liquid measure as small as 0.02 milliliter (a drop or two). This M256A1 kit, besides the military, is also used by FEMA and First Responders, who we are now selling it to. Government agencies only should contact Shane Connor for large quantity availability. Please note, this product cannot identify biological agents, such as Anthrax. New manufacture in 12/02, expiration date 12/08. SPECIAL INTRODUCTORY OFFER - VERY LIMITED QUANTITY! You can buy as many of these M256A1 Detector Kits as you want for only $240.00 each for as long as they last! Otherwise, because of the very limited supply here, we need to restrict sales to ONE M256A1 Detector Kit per customer. What's some practical strategies for the public to employ M9, M8, M256A1 kit & Anthrax Test? First; if stuck into the window sill on the outside, but out of the rain, you could tell from the safety of inside your home if it was detecting anything outside to have it start changing color. Also, when the all-clear was finally sounded, you'd have some independent confirmation that for your own property and neighborhood it really was OK, as well. Many others, without any such indication, won't have a clue as to what to believe or not and will not be prepared to deal well with such deadly uncertainties and possibly even be paralyzed with fear. Secondly; if we did get into something nasty, having these detectors inside your safe room, too, would also help calm all there that with no color change they were still safe. Placing them along hallways outside the safe room and even throughout the house would also help every ones confidence level later that when they did again utilize the rest of the house, they'd have some more assurance via the chemical indicators of how safe it was to do so. However, to be safe, decontaminate anyway. There is a chance your detection paper may be giving a false negative, or you miss the contamination some other way. DO NOT take foolish chances with chemical or biological weapons. Situations may even evolve where neighborhood evacuations are called for before an approaching chemical agent arrives on the wind. With your own chemical detection in-hand, you'll be able to confirm every step of the way for your family that you are not inadvertently moving into harm. Or, if the wind had just changed, you'll be able to confirm if your safe route and/or preferred safe destination, really still is. Also, when travelling or at the mall or an auditorium, etc., if anything ever happened that was panicking people (on foot or in cars) that a chemical attack had been launched there, you could also pull out one of these M9 or M8 strips as you exited the area so as to expose it to the air about you. Whether it was in your hand as you got out of the area or jammed into your closed car window as you drove off, but where you could still see it, half in and half out, you'd potentially have a clue as to how bad it really was right where you are, both inside the car and outside. The panic could potentially be deadlier than the 'event', especially so if it's a false alarm, and the information gleaned from your chemical detector could help you make wiser choices on how eagerly you'd then risk joining in with a dangerous trampling stampede or crazy panicked drivers, or not. There are plenty more creative strategies for employing these chemical detectors around where you live, work, play and how/where you travel, especially when moving through high density population targets. Getting that peace-of-mind confirmation that the area you or your family frequents looks clear is a bonus benefit, not to be overlooked. It's something that few others will know and all will eagerly desire, in addition to your being warned when it might not be safe to go out right now. The M256A1 detection and identification kit is most often used after a chemical attack to confirm when if it is again safe enough to unmask or exit your safe room. Your M8 and M9 may no longer be 'spotting up', indicating that the deposition of the nerve agent aerosol or liquid has ceased, but they can not tell you about any lingering and residual vapors that have not yet dissipated. The M256A1 can test for these chemical agents in the vapor form. The M8 and M9 are the standard for early detection and the M256A1 would normally be used to assure the threat has fully passed. This is one of the military's most sensitive devices for detecting Chemical Agents and detects all agents at levels below those that can kill or injure people. Regarding Anthrax testing: Anthrax is not something the untrained general public should be testing for. Conducting environmental sampling places them at risk for exposure to Bacillus anthracis, the organism causing anthrax, and they should be both trained in the procedures and wearing protective personal equipment (PPE), including respiratory devices, protective clothing, and gloves. For more information read both these CDC reports: Comprehensive Procedures for Collecting Environmental Samples for Culturing Bacillus anthracis - Revised April 2002 and Protecting Investigators Performing Environmental Sampling for Bacillus anthracis: Personal Protective Equipment. The field behavior of chemical agents is dependent on weather variables such as wind, temperature, air stability, humidity, and precipitation. The influence of each variable depends upon the synoptic situation and is locally influenced by topography, vegetation, and soil. Chemical agents may appear in the field in different forms: vapors, aerosols, or liquids. To understand the impact of chemical agents on the battlefield, the soldier must also understand how these agents are affected by weather and terrain. The following paragraphs give an overview of the basic characteristics of chemical agents and how weather and terrain influence and have specific effects on them. Vapors and small particles are carried by the winds, while any large particles and liquid drops fall out in a ballistic-like trajectory and are quickly deposited on the ground. Many agents give off vapors that form vapor clouds. The speed at which an agent gives off vapors is called volatility. Agents may be removed naturally from the air by falling out (large particles fall out much more quickly), by sticking to the ground or vegetation, or by being removed by precipitation. Once deposited upon vegetation or other ground cover, volatile agents may be re- released to the atmosphere for further cycles of travel and present a hazard until sufficiently diluted or decontaminated. During approximately the first 30 seconds, the size and travel of an agent are determined primarily by the functioning characteristics of the munition or delivery system. Thereafter, the travel and diffusion of the agent cloud are determined primarily by weather and terrain. For example, in high temperatures, volatile agents produce maximum agent vapor in 15 seconds. Light winds and low turbulence allow high local concentrations of agents. High winds and strong turbulence reduce the concentration and increase the area coverage by more quickly carrying away and diffusing the agent cloud. When a chemical agent is disseminated as a vapor from a bursting munition, initially the cloud expands, grows cooler and heavier, and tends to retain its form. The height to which the cloud rises, due to its buoyancy, is called the height of the thermally stabilized cloud. If the vapor density of the released agent is less than the vapor density of air, the cloud rises quite rapidly, mixes with the surrounding air, and dilutes rapidly. If the agent forms a dense gas (the vapor density of the released agent is greater than the vapor density of air), the cloud flattens, sinks, and flows over the earth's surface. Generally, cloud growth during the first 30 seconds is more dependent upon the munition or delivery system than upon surrounding meteorological conditions. Nevertheless, the height to which the cloud eventually rises depends upon air temperature and turbulence. These determine how much cooler, ambient air is pulled into the hot cloud (and, hence, determines its rate of cooling). The agent concentration buildup is influenced by both the amount and speed of agent release and by existing meteorological conditions. Shortly after release, the agent cloud assumes the temperature of the surrounding air and moves in the direction and at the speed of the surrounding air. The chemical cloud is subjected to turbulence forces of the air, which tend to stretch it, tear it apart, and dilute it. The heavier the agent, the longer the cloud retains its integrity. Under conditions of low turbulence, the chemical agent cloud travels great distances with little decrease in agent vapor concentration. As turbulence increases, the agent cloud dilutes or dissipates faster. Aerosols are finely divided liquid and/or solid substances suspended in the atmosphere. Sometimes dissolved gases are also present in the liquids in the aerosols. Chemical agent aerosol clouds can be generated by thermal munitions and aerosol spray devices or as by-products of liquid spray devices and bursting munitions. Airborne aerosols behave in much the same manner as vaporized agents. Initially, aerosol clouds formed from thermal generators have a higher temperature than clouds formed from other types of munitions. This may cause some initial rise of the cloud at the release point. Aerosol generated clouds are heavier than vapor clouds, and they tend to retain their forms and settle back to earth. Being heavier than vapor clouds, they are influenced less by turbulence. However, as the clouds travel downwind, gravity settles out the larger, heavier particles. Many particles stick to leaves and other vegetative surfaces they contact. When a chemical agent is used for its liquid effect, evaporation causes the agent to form into vapor. Depending upon volatility, vapor clouds are usually of low concentration, have about the same temperature as the surrounding air, and tend to stay near the surface because of high vapor density. Additionally, vapor density governs the extent that the vapor will mix with the air. Liquid agents with high vapor density impact at ground level with very little evaporation of the agent. These agents are termed persistent agents. While drops are airborne, and after impacting, the liquid continues to evaporate. Agent vapor pressure will govern the rate at which the liquid will evaporate at a given temperature and pressure. Initial concentrations are lower, since the vapor source is not instantaneous as a vapor agent is but evolves over a long period (until the liquid source is gone). Liquid agents may be absorbed (soaked into a surface) and adsorbed (adhered to a surface), and they may also evaporate. Once the liquid is no longer present on the surface, desorption (going back into the air) begins. The vapor concentration over areas contaminated with a liquid agent tends to be less than with newly formed vapor clouds, and downwind agent concentrations are not nearly as great as with other types of agents. acetylcholinesterase An enzyme that hydrolyzes the neurotransmitter acetylcholine. The action of this enzyme is inhibited by nerve agents. aerosol Fine liquid or solid particles suspended in a gas; for example, fog or smoke. atropine A compound used as an antidote for nerve agents. casualty (toxic) agents Produce incapacitation, serious injury, or death. They can be used to incapacitate or kill victims. These agents are the choking, blister, nerve, and blood agents. Choking Agents Substances that cause physical injury to the lungs. Exposure is through inhalation. In extreme cases, membranes swell and lungs become filled with liquid. Death results from lack of oxygen; hence, the victim is "choked"
Blister Agents Substances that cause blistering of the skin. Exposure is through liquid or vapor contact with any exposed tissue (eyes, skin, lungs). Nerve Agents Substances that interfere with the central nervous system. Exposure is primarily through contact with the liquid (skin and eyes) and secondarily through inhalation of the vapor. Three distinct symptoms associated with nerve agents are: pin-point pupils, an extreme headache, and severe tightness in the chest. Blood Agents Substances that injure a person by interfering with cell respiration (the exchange of oxygen and carbon dioxide between blood and tissues). chemical agent A chemical substance that is intended for use in military operations to kill, seriously injure, or incapacitate people through its physiological effects. Excluded from consideration are riot control agents, and smoke and flame materials. The agent may appear as a vapor, aerosol, or liquid; it can be either a casualty/toxic agent or an incapacitating agent. cutaneous Pertaining to the skin. decontamination The process of making any person, object, or area safe by absorbing, destroying, neutralizing, making harmless, or removing the hazardous material. G-series nerve agents Chemical agents of moderate to high toxicity developed in the 1930s. Examples are tabun (GA), sarin (GB), soman (GD), and GF. Incapacitating agents Produce temporary physiological and/or mental effects via action on the central nervous system. Effects may persist for hours or days, but victims usually do not require medical treatment. However, such treatment speeds recovery. vomiting agents Produce nausea and vomiting effects, can also cause coughing, sneezing, pain in the nose and throat, nasal discharge, and tears. agents Produce irritating or disabling effects that rapidly disappear within minutes after exposure ceases. system depressants Compounds that have the predominant effect of depressing or blocking the activity of the central nervous system. The primary mental effects include the disruption of the ability to think, sedation, and lack of motivation. system stimulants Compounds that have the predominant effect of flooding the brain with too much information. The primary mental effect is loss of concentration, causing indecisiveness and the inability to act in a sustained, purposeful manner. industrial agents Chemicals developed or manufactured for use in industrial operations or research by industry, government, or academia. These chemicals are not primarily manufactured for the specific purpose of producing human casualties or rendering equipment, facilities, or areas dangerous for use by man. Hydrogen cyanide, cyanogen chloride, phosgene, chloropicrin and many herbicides and pesticides are industrial chemicals that also can be chemical agents. liquid agent A chemical agent that appears to be an oily film or droplets. The color ranges from clear to brownish amber. nonpersistent agent An agent that upon release loses its ability to cause casualties after 10 to 15 minutes. It has a high evaporation rate and is lighter than air and will disperse rapidly. It is considered to be a short-term hazard. However, in small unventilated areas, the agent will be more persistent. organophosphorous compound A compound, containing the elements phosphorus and carbon, whose physiological effects include inhibition of acetylcholinesterase. Many pesticides (malathione and parathion) and virtually all nerve agents are organophosphorous compounds. percutaneous agent Able to be absorbed by the body through the skin. persistent agent An agent that upon release retains its casualty-producing effects for an extended period of time, usually anywhere from 30 minutes to several days. A persistent agent usually has a low evaporation rate and its vapor is heavier than air. Therefore, its vapor cloud tends to hug the ground. It is considered to be a long-term hazard. Although inhalation hazards are still a concern, extreme caution should be taken to avoid skin contact as well. protection Any means by which an individual protects his body. Measures include masks, self-contained breathing apparatuses, clothing, structures such as buildings, and vehicles. V-series nerve agents Chemical agents of moderate to high toxicity developed in the 1950s. They are generally persistent. Examples are VE, VG, VM, VS, and VX. vapor agent A gaseous form of a chemical agent. If heavier than air, the cloud will be close to the ground. If lighter than air, the cloud will rise and disperse more quickly. volatility A measure of how readily a substance will vaporize. antibiotic A substance that inhibits the growth of or kills microorganisms. antisera The liquid part of blood containing antibodies, that react against disease causing agents such as those used in BW. bacteria Single-celled organisms that multiply by cell division and that can cause disease in humans, plants, or animals. biochemicals The chemicals that make up or are produced by living things. biological warfare agents Living organisms or the materials derived from them that cause disease in or harm to humans, animals, or plants, or cause deterioration of material. Biological agents may be used as liquid droplets, aerosols, or dry powders. biological warfare The intentional use of biological agents as weapons to kill or injure humans, animals, or plants, or to damage equipment. bioregulators Biochemicals that regulate bodily functions. Bioregulators that are produced by the body are termed "endogenous." Some of these same bioregulators can be chemically synthesized. causative agent The organism or toxin that is responsible for causing a specific disease or harmful effect. contagious Capable of being transmitted from one person to another. culture A population of micro-organisms grown in a medium. decontamination The process of making people, objects, or areas safe by absorbing, destroying, neutralizing, making harmless, or removing the hazardous material. fungi Any of a group of plants mainly characterized by the absence of chlorophyll, the green colored compound found in other plants. Fungi range from microscopic single-celled plants (such as molds and mildews) to large plants (such as mushrooms). host An animal or plant that harbors or nourishes another organism. incapacitating agent Agents that produce physical or psychological effects, or both, that may persist for hours or days after exposure, rendering victims incapable of performing normal physical and mental tasks. infectious agents Biological agents capable of causing disease in a susceptible host. infectivity (1) The ability of an organism to spread. (2) The number of organisms required to cause an infection to secondary hosts. (3) The capability of an organism to spread out from the site of infection and cause disease in the host organism. Infectivity also can be viewed as the number of organisms required to cause an infection. mycotoxin A toxin produced by fungi. microorganism Any organism, such as bacteria, viruses, and some fungi, that can be seen only with a microscope. nebulizer A device for producing a fine spray or aerosol. organism Any individual living thing, whether animal or plant. parasite Any organism that lives in or on another organism without providing benefit in return. pathogen Any organism (usually living) capable of producing serious disease or death, such as bacteria, fungi, and viruses. pathogenic agents Biological agents capable of causing serious disease. route of exposure (entry) The path by which a person comes into contact with an agent or organism; for example, through breathing, digestion, or skin contact. single-cell protein Protein-rich material obtained from cultured algae, fungi, protein and bacteria, and often used as food or animal feed. spore A reproductive form some micro-organisms can take to become resistant to environmental conditions, such as extreme heat or cold, while in a "resting stage." toxicity A measure of the harmful effect produced by a given amount of a toxin on a living organism. The relative toxicity of an agent can be expressed in milligrams of toxin needed per kilogram of body weight to kill experimental animals. toxins Poisonous substances produced by living organisms. vaccine A preparation of killed or weakened microorganism products used to artificially induce immunity against a disease. vector An agent, such as an insect or rat, capable of transferring a pathogen from one organism to another. venom A poison produced in the glands of some animals; for example, snakes, scorpions, or bees. virus An infectious micro-organism that exists as a particle rather than as a complete cell. Particle sizes range from 20 to 400 manometers (one-billionth of a meter). Viruses . are not capable of reproducing outside of a host cell. When An ill Wind Blows From Afar! Just Released... KI4U's Review of 'Countdown To Zero' movie! © www.NukAlert.com 2003, 2004, 2005, 2006, 2007, 2008, 2009, 2010, 2011. All Rights Reserved. © www.RadShelters4U.com 2002, 2003, 2004, 2005, 2006, 2007, 2008, 2009, 2010, 2011. All Rights Reserved. © www.RadMeters4U.com 2001, 2002, 2003, 2004, 2005, 2006, 2007, 2008, 2009, 2010, 2011. All Rights Reserved. © www.KI4U.com 1999, 2000, 2001, 2002, 2003, 2004, 2005, 2006, 2007, 2008, 2009, 2010, 2011. All Rights Reserved.